Radiofrequency (RF) energy treatment is a new and promising technology for non-surgical body contouring, fat and cellulite reduction. Pure RF energy alone (such as the Accent™, Thermage™ and Tripollar™ devices) or RF in combination with other modalities (such as the Velasmooth™/Velashape™ device which combines RF with infrared, tissue mobilisation and suction) can be used in treatments to effectively contour the body and reduce the appearance of cellulite and fat. With deep, controlled heating of the fatty layers under the skin, the effects of tissue tightening and increased blood circulation mean that fatty deposits are drained through the lymphatic system, reducing the appearance of cellulite. Based on current RF technologies, most people should see at least a mild improvement in their skin tone, with a temporary reduction in the appearance of cellulite and possible inch loss, with minimal risks and downtime. Prices for radiofrequency depend on the area(s) treated and the device used. The BTL Vanquish is the only contactless radiofrequency technology for non-invasive fat removal. The latest generation of the device is the BTL Vanquish ME, standing for Maximum Energy. However with recent developments in cryogenics (the use of extremely cold substances) and information technology, non-ablative RF energy is the newest addition to the treatment options available for cellulite and fat reduction. With the introduction of cryogenics it is possible to deliver RF energy to the deep dermis and sub-dermal layers of the skin, whilst protecting the epidermis. Heating in this area, without damaging the outer layers of skin, causes microscopic changes to the tissues and collagen contraction, with subsequent collagen remodelling over the months that pass. By applying RF energy to the human body, which can conduct current and therefore act as part of the electrical circuit, any resistance encountered by the energy flow will cause heat to be produced at the site of maximum resistance, which can be used to cut or coagulate tissue. When comparing non-ablative (procedures that do not involve the destruction of the outer layer of the skin) techniques, RF energy differs from laser (light) energy in that light energy tends to scatter or absorb into the upper layers of the skin, making it difficult to deliver sufficient heat into the deeper layers without damaging the skin's surface. Lasers therefore affect collagen in the upper dermis, improving fine lines, wrinkles and skin texture, while RF energy is able to penetrate deeper into the skin and affect the deeper dermis and subcutaneous layers, causing tightening and improvements to the underlying tissue structure, but with little change in skin texture. Bipolar refers to a device having two poles or electrodes. The Thermage™ system is a monopolar RF device that uses patented technology within its ThermaTip™ to deliver RF energy deep into dermal tissues. This heating action causes deep collagen structures in the skin to immediately tighten. Over time, new collagen is produced by the body to further tighten the skin. This device was originally used mainly for facial rejuvenation but has now been expanded for use on other areas of the body and for the temporary reduction in the appearance of cellulite. It was cleared by the U.S. Food and Drug Administration (FDA) in November 2002 for non-invasive treatment around the eyes, and then in June 2004 for the treatment of facial wrinkles, followed by off-face for the non-invasive treatment of wrinkles in January 2006. Thermage is the first and only system to receive FDA clearance for non-invasive eyelid treatments which was received in June 2007. It is also FDA cleared for the temporary improvement in the appearance of cellulite (when combined with vibration). RF in combination with light based technologies has the effect of removing the focal point that the light would normally seek out. For example, ablative carbon dioxide (CO2) lasers used in skin resurfacing seek water within the surface layers of the skin, which it heats up, causing both the water and the outermost layers of the skin to vapourise. Non ablative lasers and IPL however seek colour, such as the skin’s pigment (in the case of tattoo or port wine stain removal), or the colour of a hair follicle for hair removal treatments. The Velasmooth™ & VelaShape™ combined Infrared and RF energy technology (plus tissue mobilisation and suction) has proven to be an effective body contour and fat reduction tool, as well as cellulite reduction tool. Pure RF energy alone (such as the Accent™ device) or RF in combination with other modalities (such as the Velasmooth™ device which combines RF with infrared, tissue mobilisation and suction) can be used in treatments to effectively contour the body and reduce the appearance of cellulite and fat. With deep, controlled heating of the fatty layers under the skin, the effects of tissue tightening and increased blood circulation mean that fatty deposits are drained through the lymphatic system, reducing the appearance of cellulite. What happens during a Radiofrequency For Cellulite & Fat treatment? Depending on your pain tolerance, a topical anaesthetic cream may then be applied to your skin a short time prior to treatment, to help numb the skin slightly; this will normally be removed using alcohol cleansers immediately before your clinician commences the procedure. Depending on the device being used and your practitioner, a “treatment grid” may then be drawn over the treatment area to assist the practitioner in navigating whilst delivering the RF energy; helping to assure an even application of the RF. A lubricating oil, gel or cream will then also be applied over the area to be treated which acts as an additional barrier between the surface layers of your skin and the handpiece of the device, mainly to avoid skin chafing. Your clinician will then commence the RF treatment working across the treatment area. Once completed a soothing gel/lotion or cold pack may be applied to your skin. Depending on the device being used it may be recommended to have a session twice weekly with an average of 8 - 10 sessions in a treatment programme, or a session once every 1 - 2 weeks with an average of 8 sessions in a programme, however with all devices ongoing monthly maintenance will be required; your practitioner will be able to determine a course of treatments specific to you and your needs. How long will it take to recover from Radiofrequency For Cellulite & Fat? What are the risks and potential complications from Radiofrequency For Cellulite & Fat treatment? As the treatment is carried out you will experience heating sensations every time the RF energy is delivered to your skin and underlying tissue. Some devices have inbuilt cooling mechanisms, to protect your skin from the heating, and make the treatment more comfortable. The most frequently reported side effects of treatment with RF energy are swelling, redness or bruising on or around the treated area, which typically disappear in a few days or weeks. There are also reports of a feeling of dry skin in the treated area for a couple of days, lubrication with aloe-vera can be helpful for this. Some people may notice a slight increase in urine output following treatment, especially with the Velasmooth™. This is because any excessive fluid build up in between cells in the area treated is drained through the lymphatic system via the treatment process – this then gets excreted in the urine. What should you do after a Radiofrequency For Cellulite & Fat treatment? Who should not have a Radiofrequency For Cellulite & Fat treatment? 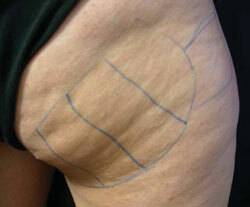 Who can perform Radiofrequency For Cellulite & Fat? What is the average cost of Radiofrequency For Cellulite & Fat? Private prices for radiofrequency treatments depend on the area(s) being treated and the device being used. Private costs for Velasmooth™ can range from £80 - £100 per 60 minute session, often with a discount for a course of 8 - 12 treatments. Private costs for Accent™ body contouring and cellulite treatments can start from approximately £100 - £300 per body area per session. Discounts often apply for a course of sessions. Private costs for TriPollar™ treatments depend on the area(s) being treated and can range between £80 - £200 per area per session. Discounts often apply for a course of sessions. RF energy treatment is a new and promising technology for non-surgical body contouring, fat and cellulite reduction. Based on current RF technologies available, most people should see at least a mild improvement in their skin tone and smoothness, with a temporary reduction in the appearance of cellulite and possible inch loss, with minimal risks and downtime compared to surgery. 1 month after 8 treatments. Excellent results 6 months after 10 treatments. Images provided courtesy of Syneron Medical Ltd.
Click for ALL Radiofrequency For Cellulite & Fat clinics in the UK & Ireland registered and verified by Consulting Room.